In today's Dirt Bag, we mentioned that Beyoncé's Vogue cover had been leaked to the internet at large. While Bey looks undoubtedly beautiful on the Power Issue — her double winged eye liner, arched eyebrows and darker hair color are all downright enviable — couldn't they have done something besides the whole Audrey Hepburn-Breakfast at Tiffany's thing that they've done so many times before? 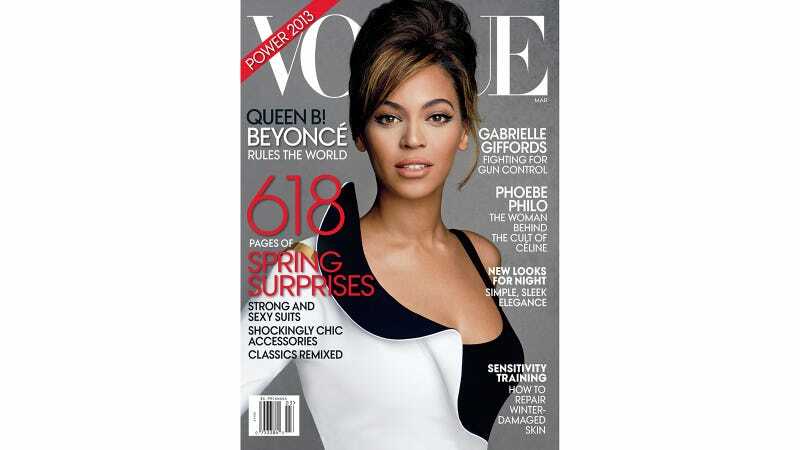 The photo is a definite improvement from the last time Beyoncé covered Vogue, but it's still a bit Snoozeville, USA. They're touting her as Queen B, for Christ's sake! Where's the McQueen? Where's the gold breast plate? Where's the drama? Why didn't Vogue take a page from Beyoncé's own tour promo? We wanted Sasha Fierce, but — womp womp — all we got was Kate Middleton.